New data provides the first proof that the Earth has a natural thermostat which enables the planet to recover from extremes of climate change – but the recovery timescales are significant. This work was presented at the Goldschmidt conference in Paris, and has just been published in the peer-reviewed journal Geochemical Perspectives Letters*. The idea of a natural temperature thermostat was first proposed in 1981, but until now no-one has been able to provide data to show that the recovery from the hot and cold temperature fluctuations were associated with a specific mechanism. Now a group of British scientists has shown that recovery from global cooling events is associated with changes in the rate of weathering of rocks, which is the main mechanism of removing CO2 from the atmosphere. In weathering, rocks are dissolved by rain and river water; the process removes CO2 from the atmosphere, which is then transported to the seas by rivers to be locked up in carbon-rich rocks such as limestone. The more weathering, the more CO2 is removed from the atmosphere. The team had previously found evidence supporting the role of weathering in cooling the Earth in times of high temperature. This current work confirms that a slow-down of weathering takes place in cold periods, and so supports the concept of an “Earth thermostat”. The researchers were able to use the Lithium isotope ratios in rocks as a measure of weathering. They examined rocks from the period of the Hirnantian glaciation – around 445 million years ago – which correspond with the second greatest extinction of life in history, when around 85% of marine species were wiped out, due to the cooling and a dramatic drop in sea levels (estimated at around 80m) as water was locked into ice fields and glaciers. The samples, which came from Anticosti Island (Quebec, Canada), and Dob’s Linn (near Moffat, Scotland), show that global chemical weathering rate declined by a factor of four temporarily during the 5C cooling that caused the glaciation, removing less CO2, allowing the climate to recover from the cooling. 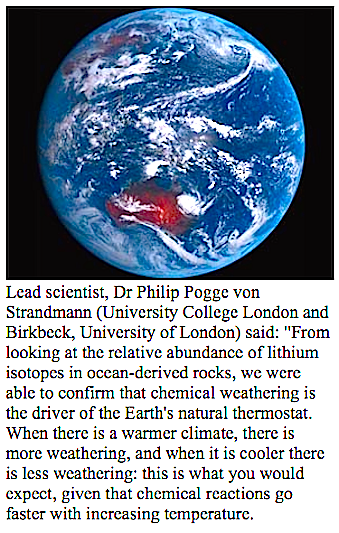 Lead scientist, Dr Philip Pogge von Strandmann (University College London and Birkbeck, University of London) said: “From looking at the relative abundance of lithium isotopes in ocean-derived rocks, we were able to confirm that chemical weathering is the driver of the Earth’s natural thermostat. When there is a warmer climate, there is more weathering, and when it is cooler there is less weathering: this is what you would expect, given that chemical reactions go faster with increasing temperature. “So more weathering removes CO2 from the atmosphere and puts a break on global warming. However, when the temperature cools, the reverse is true, and less CO2 is removed from the atmosphere in cold periods. This is the process that has allowed life to survive on Earth for around 4 billion years, and is what we are reporting in Paris”. Nevertheless, we need to be clear that the changes in temperature are gradual, and that recovery can take hundreds of thousands of years. Given the rapid increase in the rate of global warming at present, this kind of wait is not an option for us”. “The theory that chemical weathering provides a stabilizing feedback on Earth’s climate goes back several decades, but observational confirmation of this hypothesis has been incomplete. In this study, Pogge von Strandmann and colleagues add a critical new piece of confirmation by using lithium isotopes to demonstrate a reduction in the chemical weathering rate associated with climate cooling – exactly the behaviour predicted if rates of chemical weathering serve as a stabilizing feedback on climate. “This study is illustrates beautifully how new isotope proxy systems are enabling critical new tests of hypotheses both old and new and, in this case, confirming a theory that helps to explain why the Earth has enabled life to flourish continuously for more than 3.5 billion years”.